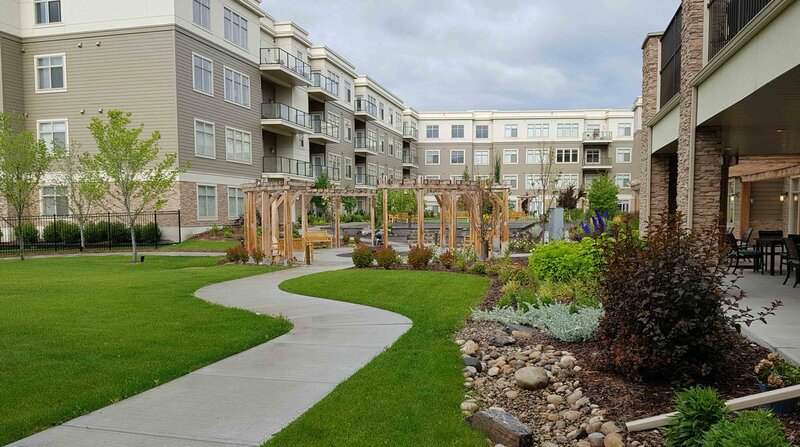 Jean and Dean Geddes have lived at United’s Fish Creek community for less than a year. 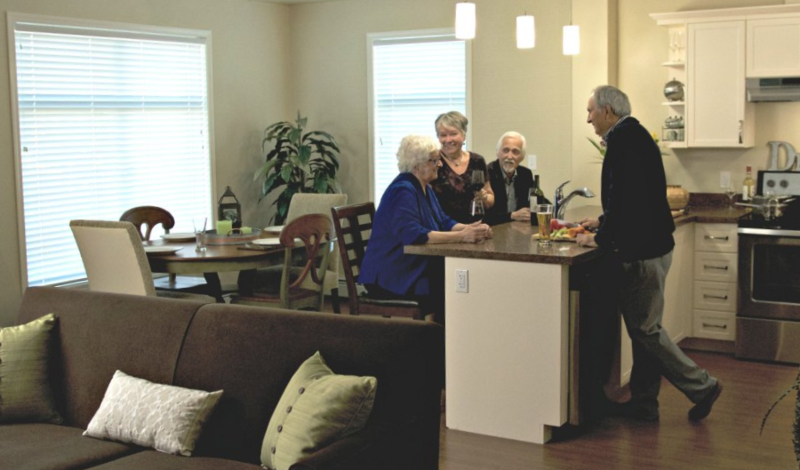 They moved to Fish Creek West because the suite they chose was a perfect fit for their lifestyle. “I’m a professional painter and find the north light is just perfect for my home studio,” said Jean. The dining room is large enough that they have set up an easel and paint supplies and still have plenty of room for a dining table. 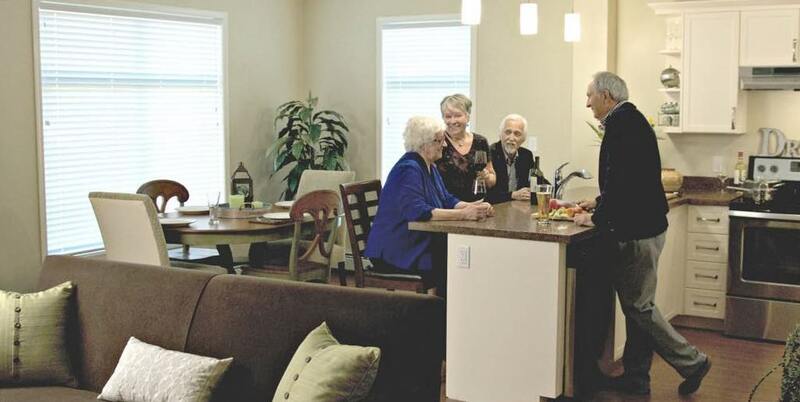 Jean and Dean, who are both in their 80s, had been thinking about a move to an older adult community for several years. They shopped around and settled on Fish Creek West. As an artist, Jean gets her inspiration from nature, so she and Dean regularly spend time in the mountains, sometimes for just the day, but often for a week or more, so Jean can search out the scenes that catch her eye. “I set up my easel, paint, take photos, and Dean helps carry everything I need. In fact, his business card says ‘Sherpa’! she laughs. 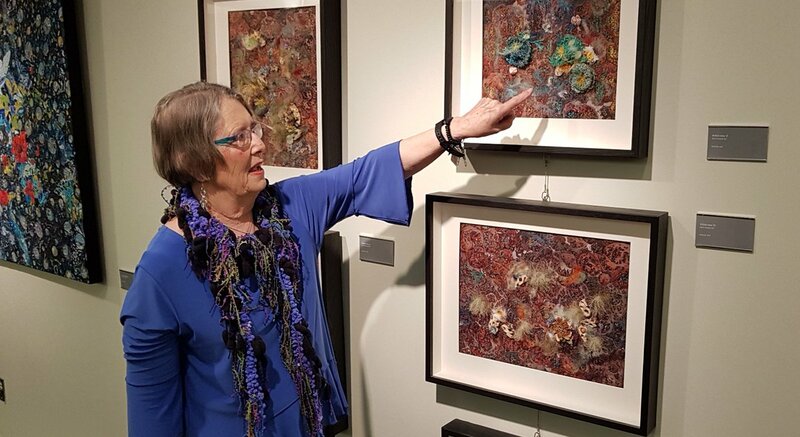 “And,” she adds, ” because we are in wild animal country, Dean watches my back for bears.” Her work is currently displayed at a gallery in the Fairmont Banff Springs Hotel and at the Collector’s Gallery of Art in Inglewood. 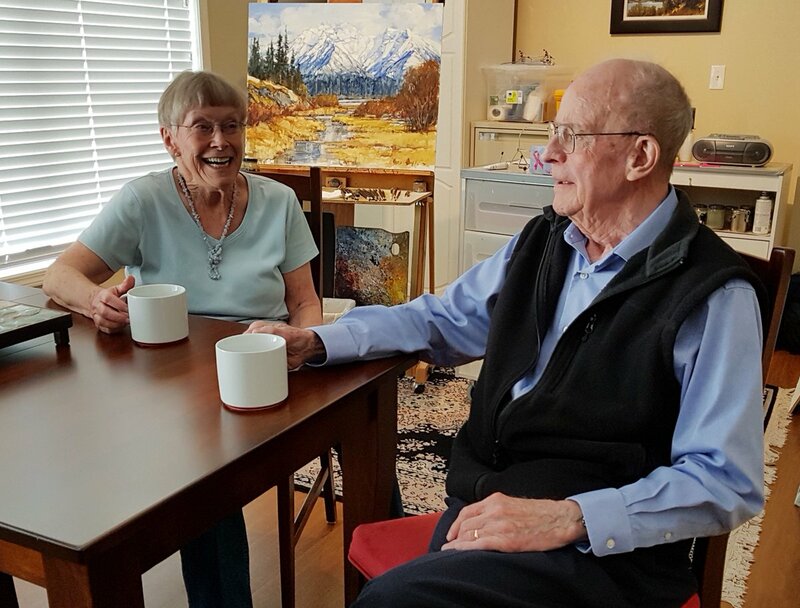 Jean is very impressed with the quality of the Fish Creek art studio, where professional artists work with residents of varying experience and talent. 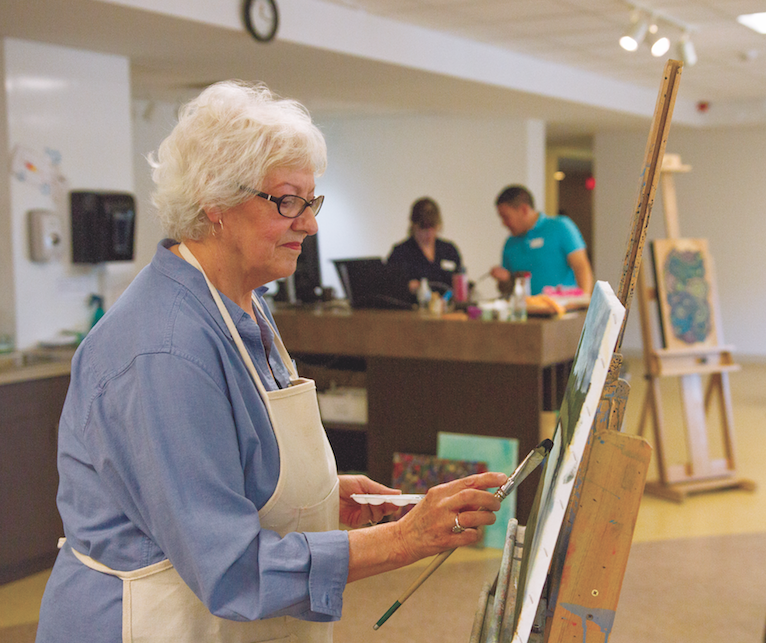 “They have very skilled and well-trained artists and teachers here,” said Jean. “Jeff Chan is so skilled at initiating projects for people who have never picked up a brush before. Every month there is something new!” The art studio is currently establishing a woodworking area, and also features a clay wheel and kiln where artist Lulu Suraya teaches residents about working with clay, and Chantel Traub and Maddison Klein bring their multi-disciplined creative skills. As well, Dean liked the fact that United is a Calgary company. Corporate decisions are made locally and quickly, and small requests are handled without delay. Both are pleased with the decision they made and don’t hesitate to have their friends and family over for visits or meals. 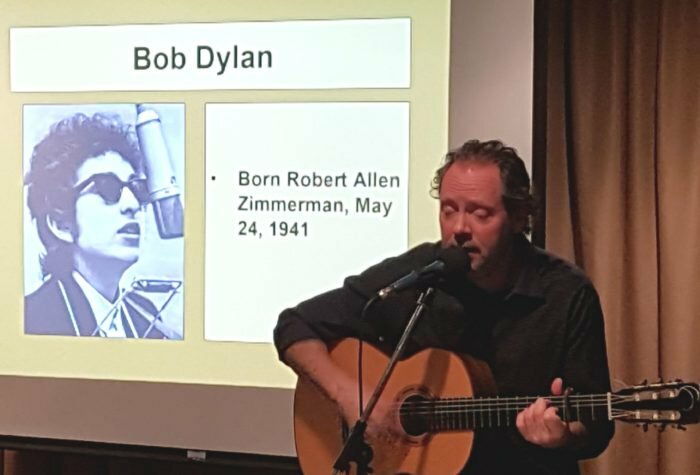 Photos and video by Sherana Productions.